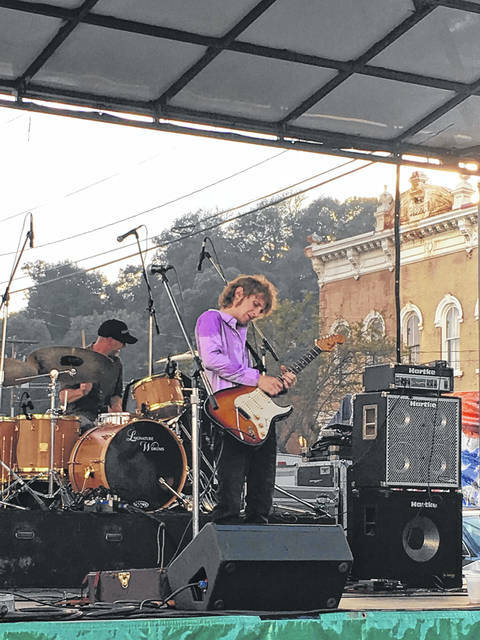 Crowds will once again gather in downtown Pomeroy for the annual Blues Bash. Noah Wotherspoon performing on the main stage at last year’s Blues Bash. 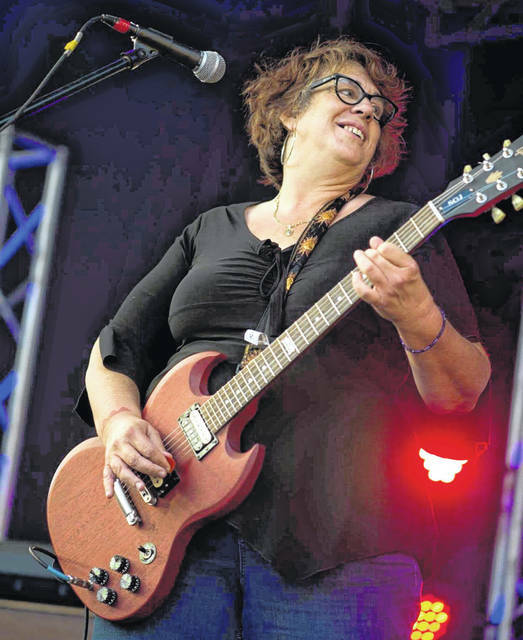 POMEROY — The 18th annual Big Bend Blues Bash will be held July 27 and 28 in downtown Pomeroy. 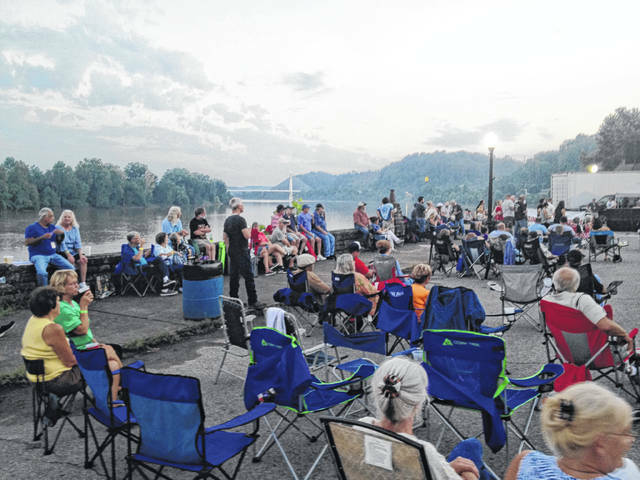 The annual event features two days of blues and local craft beers along the Ohio River in Pomeroy. Craft beer companies such as Pomeroy’s Maple Lawn Brewery, Cider House, Sixth Sense Brewing Company, North High Brewing Company, and Devil’s Kettle will be set up for the weekend. Free camping and boat docking on the Ohio River will be available. Ticket cost is $20 for Friday, $25 for Saturday, and $40 for a weekend pass. On Friday evening the first performer will go on at 6 p.m. with the last performer on at 10 p.m. On Saturday, the music starts early with the first performer going on at noon and the last performer at 10 p.m.
Several returning musical favorites will take to the Blues Bash stage along with a few new faces. On Friday evening, the event will begin with Snugglefish at 6 p.m., followed by local favorites Blitzkrieg at 7 p.m.
At 8 p.m. will be Noah Wotherspoon, with Joanna Connor at 10 p.m.
Rattlesnake Shake will perform at 10 p.m. on Friday evening at the Court Grill. Snugglefish is comprised of musicians from the river cities, and plays “good time” music. Blitzkrieg, Southeast Ohio’s longest running rock band, is made up of Phil Moon on lead guitar, vocals and keyboard; Lyle Moon on bass guitar, vocals and keyboard; Ed Sisson on rhythm guitar and vocals; and Rob Heady on drums, percussion and vocals. The Noah Wotherspoon Band is from Cincinnati, Ohio. The band has been playing festivals and venues around the world, from the Mt. Baker Blues Festival in Washington to the Olsztyn Blues Nights Festival in Poland. The band’s debut studio album entitled “Mystic Mud” was also presented a “Jimi Award” for Best Blues/Rock Album of the Year in 2015 by Blues411. Joanna Connor, from Chicago, draws her musical influences from Aretha Franklin and Buddy Guy. According to her biography, Joanna cut her teeth at the famous club owned by Buddy Guy on the south side of Chicago — the Checkerboard Lounge with house band the 43rd St. blues band. Joanna was given her own night at the legendary Kingston Mines at the age of 26, was signed to Blind Pig records soon thereafter, toured 49 states and 25 countries. She was the first artist not on a major label to be signed to an endorsement deal by Gibson Guitars and Victoria Amps. She has been featured in every major city newspaper and guitar magazine. Her band was featured in a documentary for German television, and featured on NPR and House of Blues Radio Hour. She has held a house gig at the Chicago House of Blues for 10 years running and at the Kingston Mines since 2004, where she is a favorite of audiences of all ages and nationalities. Rattlesnake Shake will round out the evening at Court Grill, before taking the the Blues Bash stage on Saturday. Based in Detroit, Rattlesnake Shake is a tribute to Peter Green’s Fleetwood Mac specific to 1967 through 1970. The band formed in 2000. Rattlesnake Shake perform all the favorite hits of Fleetwood Mac prior to Stevie Nicks/Lindsay Buckingham era. Classics like Black Magic Woman, Albatross, and Green Manalishi. On Saturday, the Brent Patterson Showcase will kick things off at noon, followed by Napalm All-Stars at 1 p.m.; Blues Cowboys at 2 p.m.; Shouts & Whispers at 3 p.m.; Bernie Nau Trio at 4 p.m.; Rattlesnake Shake at 5 p.m.; Chris O’Leary Band at 6 p.m.; Lance Lopez at 8 p.m. and Dwayne Dopsie & Zydeco Hellraisers at 10 p.m.
Angela Perley & the Howlin’ Moons will return to Pomeroy to perform at the Court Grill at 10 p.m. on Saturday. Playing blues, country and classic rock, the Blues Cowboys are based in Athens. Band Members include, Dave “Uncle Buck” McPherson, bass and vocals; David Leach, drums; Mike Thompson, guitar and vocals; John Wetzel, harmonica, guitar and vocals; Michael (Tobe) Tobar, keyboards and vocals. The Blues Cowboys are a group of friends who’ve played music together in some form or another most of their lives, often with each other. 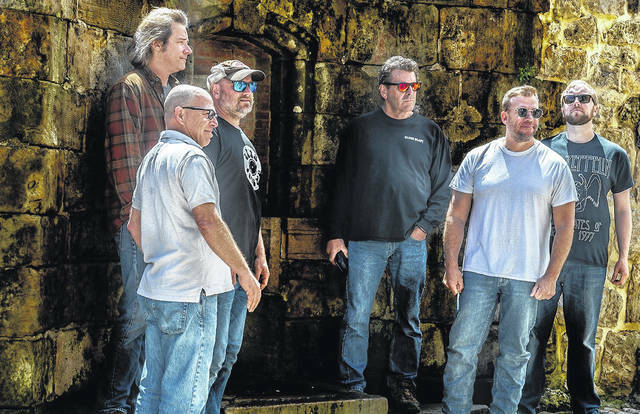 The group began when David “Uncle Buck” McPherson began having bands appear at his rustic saloon and dance barn in the deep-country near New Marshfield, Ohio.o. Shouts & Whispers, based in Athens, plays rhythm and blues. The band is comprised of Jeff Carr, acoustic and electric guitar and vocals; Bob Lazuka, electric and slide guitar and lead vocals; Scott Lee, keyboards and vocals; Carey Lea, bass, conga and vocals; and Ken Dean, drums, percussion, and vocals. As the Bernie Nau Trio, Bernie Nau and friends present classic jazz tunes in an approachable and highly listenable format. Whether you’re an experienced jazz fan or a novice, this skilled trio will take you on a musical adventure. Chris O’Leary’s musical background includes duties as lead singer and front man for rock and roll hall of famer and Grammy award winner Levon Helm’s band, The Barnburners. During the 6 years that Chris and Levon played together they toured across the US and Canada lighting up stages everywhere they went. Chris has appeared on stage with: Legendary Rolling Stones sideman Bobby Keys, The Fabulous Thunderbirds, Jimmy Vivino, Jeff Healy, Dan Akroyd, Albert Lee, Dave Edmunds, Dave Maxwell and the great James Cotton to name just a few. Chris has also recorded with Bill Perry and Hubert Sumlin, among others. The Chris O’Leary Band’s debut CD “Mr. Used to Be” won the 2011 Best New Artist Debut CD Blues Blast Award and was nominated for best new artist debut at the 2011 American Blues Music Awards. The regular members of the band include: Chris Vitarello, guitar; Matt Raymond, bass; Chris DiFrancesco, baritone sax; Andy Stahl, tenor sax; Andrei Koribanics, drums. Lance Lopez was born in Shreveport, La. In 1999, Lopez started his solo career and began touring locally and regionally opening shows for B.B. King and other legends. When he was 23, Lopez, went to Europe on his very first solo Tour in 2000-01, after getting his name known in the European market by being a member of Lucky Peterson’s band. Between 2008-11 Lance, began touring Europe again heavily and began to play bigger festivals and toured with large rock acts ZZ Top, Whitesnake, Def Leppard, and Rod Stewart. Lopez has stunned audiences worldwide with his fiery brand of Texas Blues Rock and Powerhouse performances. He has won over the likes of guitar legends like Jeff Beck, Johnny Winter, Billy Gibbons, B.B. King, and Eric Clapton who are all not only personal friends of Lopez’s, but fans. The Saturday evening headliner is Dwayne Dopsie & Zydeco Hellraisers from Louisiana. “America’s Hottest Accordion” winner, Dwayne (Dopsie) Rubin, plays a unique, high energy style of zydeco. 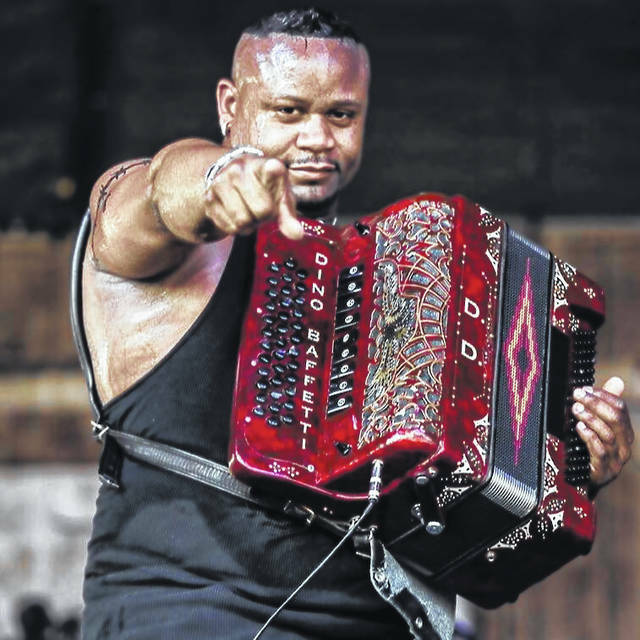 Dwayne hails from one of the most influential Zydeco families in the world. Although inspired by tradition, he has developed his own high energy style that defies existing stereotypes and blazes a refreshingly distinct path for 21st century Zydeco music. This singer/songwriter and accordionist has performed all over the world since debuting his band, Dwayne Dopsie and the Zydeco Hellraisers, at age 19. Dwayne Dopsie and The Zydeco Hellraisers not only pump out incredible Zydeco music, they also add a bit of rhythm and blues, funk, rock and roll, reggae and pop to their performances. Rounding out the 2018 Blues Bash will be Angela Perley & the Howlin’ Moons. 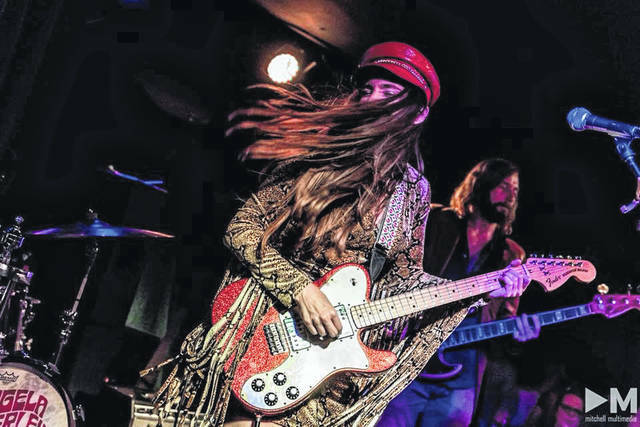 Angela Perley & the Howlin’ Moons are a Columbus, Ohio local band armed with electric guitars, swooning vocals, and songs that split the difference between rock and roll and dreamy psychedelia. The band packed the biggest punch of their career with Homemade Vision (2016). Like the band’s debut, Hey Kid (2014), an album whose kickoff track, “Athens,” earned Perley an International Songwriting Award in 2014. Homemade Vision was recorded in the Howlin’ Moons’ hometown of Columbus.